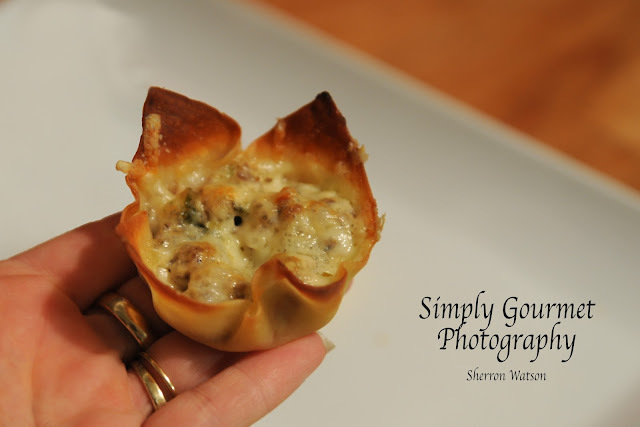 Wonton wrappers are such an easy way of making appetizers or quick finger foods for dinner. This past week has been a busy week for our family and I needed to make some things that we could eat and run or grab and go. 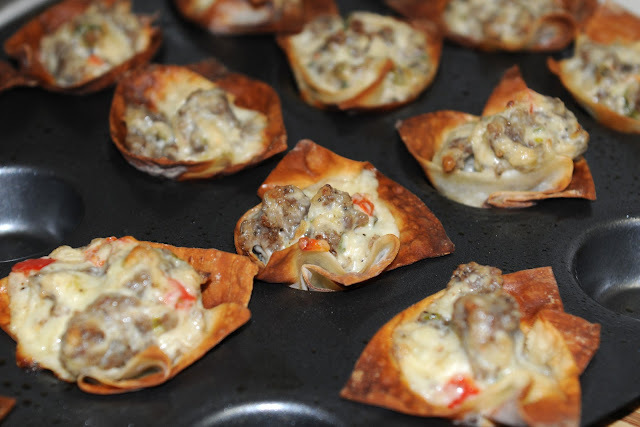 With Super Bowl just ending, a lot of people were posting wonton recipes and ideas. I never clicked through to those recipes because I figured when I decided to make them I would use what I had on hand. The ingredients, I believe, can definitely be altered based on what you have on hand or what you and your family enjoy. Now that I have made these, I can think of so many ways of changing the filling and creating tons of new "cups". Like: taco filling, pizza filling, veggie's, just cheese, etc….see, the list could fill this whole page. I tried using two different pans. I used the larger cup cake pan and my small mini muffin tin. They both worked great. 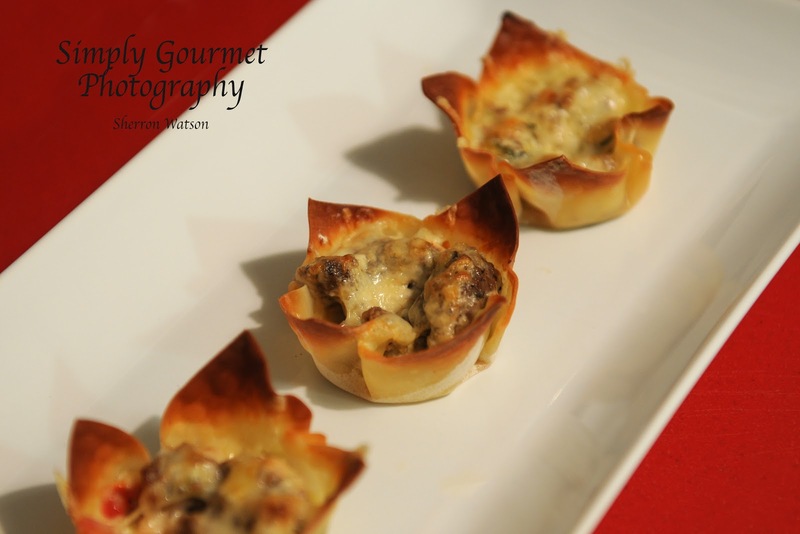 I noticed with the mini muffin tin, the wonton was more exposed to the heat and this created crispier edges. The cupcake pan was a larger size (see picture above in my hand) and this would be great for heartier cups or bigger portions. The wonton wrapper was not altered in either case. Let the wonton wrappers sit out and get to room temperature before you start. They will mold better and not break. Fry up your sausage and add the garlic, bell pepper and onion. Cook until bell pepper and onion are soft, 3-5 minutes. Cube the cream cheese and add to the sausage mixture. The cream cheese will melt and blend into the mix. Add your salt and pepper. At this time you can remove from the heat and start shaping your cups. The wonton wrappers will need to be tucked a few times in order for them to fit in your desired pan. The larger cups I put cheese in the bottom and then the filling and topped them with more cheese…really good! The smaller cups I went ahead and mixed in the cheese and used a cookie scoop to add the filling to the smaller cups. Still good but not as cheesy. Bake for 15-20 minutes. You want to keep an eye on them so that the edges do not burn. I microwaved a few the next day and they were really good…still crispy edges. NOTE: I sprayed one batch with cooking spray and one without. I did not notice a difference. They cooked the same for me. I also did not precook the wonton wrappers. I tried this with a few and again, it did not make a difference and they turned out crispy and held their shape. Oh my - those look amazing! I am bookmarking these right now! Thank you Margaret…they were pretty good!